Summer is the perfect time to hold informal gatherings and extravagant parties, and the menu almost always includes punch! Summer party punch recipes can be modified to include alcoholic liqueurs for the adults who attend, or they can be served as non-alcoholic drinks for children and those who don't choose to imbibe. Either way, just about any food fare you choose will taste great when it is accompanied by a delicious punch. A yummy punch recipe is the perfect choice for any party. Most punch recipes serve a large number of people, and they can be easily increased or reduced in volume depending upon your party needs. You can find plenty of punch inspiration in the LoveToKnow Recipes' Punch section and some alcoholic and non-alcoholic options at LoveToKnow Cocktails. In addition, you can create your very own unique party punch by combining a variety of fruit juices. Once you've created the perfect punch flavor, you can include additional garnishes or other ingredients for added flavor. For a sweeter version, purchase fruit cocktail drinks in place of the 100 percent juice variety. Introduce some fizz in your punch by adding a lime soda, such as Sprite, or mix in soda water or ginger ale. If you prefer a creamier punch, scoop large spoonfuls of sherbet or vanilla ice cream into the punch just before serving. For a fruitier punch, cut up fruit pieces like oranges, lemons and pineapples, and add them to the punch. Pour a portion of the punch into a ring mold, add cut up fruit, and freeze. Place the frozen punch ring into the punch bowl right before serving. Dip cantaloupe balls, grapes and strawberries into the punch, and then roll them in sugar. 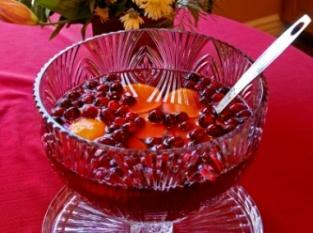 Arrange these sugared fruits in a bowl for guests to eat alone or place in their punch-filled cups. For those who want their punch to have that added "kick," mix in your favorite rum. The following recipes can be easily modified in volume and flavor. You may want to test them out several weeks in advance of the party so you have time to taste and make any changes per your preferences. Heat the water until it comes to a boil. Add sugar, cinnamon and cloves and stir continuously until the sugar is dissolved. Remove the pan from the stove, and steep the tea bags until the liquid has cooled. Remove the cinnamon sticks and place the punch in a pourable container. Refrigerate until it's time to serve. Mix in the rum and add the orange slices. Pour over ice and serve. Mix all of the ingredients with the exception of the sherbet. Chill overnight, and add scoops of your favorite sherbet immediately before serving. No matter the occasion, your party can be a huge success if you pay attention to a few details. Try out foods, punches, and other recipes a few days before the big event. Be sure you have plenty of everything, and if you are serving a fruity punch recipe, make sure the fruit you serve is as fresh as possible. Cut up fruits ahead of time, and mix and chill your party drinks overnight. Avoid adding a lot of ice, which can water down the punch, and instead, freeze punch in ice cubes or a ring mold to add to the punch before serving. Finally, remember that the perfect punch recipe can add a delicious touch to your next summer gala!